At Rockbrook there's a game being played every day. 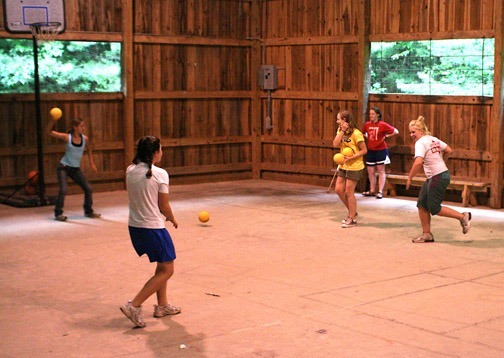 Girls get together for organized games of basketball, or volleyball, or good old fashioned dodge ball. 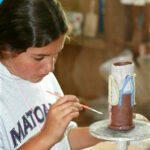 They have fun during regular activities like tennis or during free time periods. 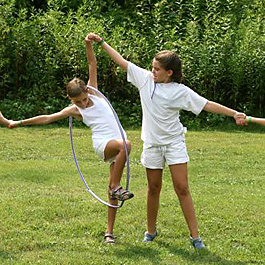 The camp games we play include classics like tetherball, frisbee and different forms of tag, but also silly new games such as granny bingo, coconut bowling, relay races, and horse events. 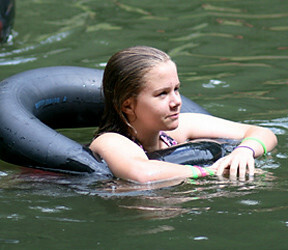 Everyone love summer camp games! Sometimes you have to get a little messy to feel this good. 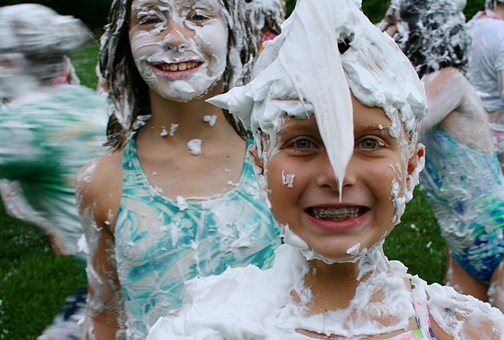 Like tonight after dinner when we had a shaving cream fight down on the landsports field. Chase announced the optional event in the dining hall, and from the cheering it was clear we would have plenty of girls ready to romp about with the slippery white foam. 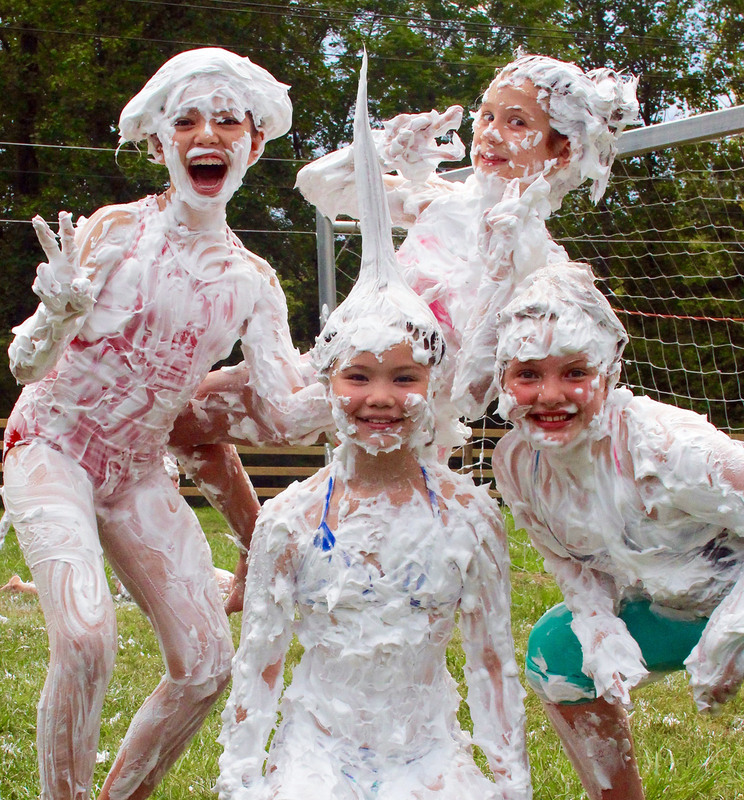 The point of a shaving cream fight is simple— spray the contents of your can both on others and on yourself. Then run around smearing, wiping and rubbing the shaving cream into everyone’s hair, on their backs, and ultimately everywhere. Beyond that, the goal is to have fun, be silly and enjoy the mess of it all. It’s as simple as that. There are no teams, and this is not a competition where we pick a winner at the end. So it’s not much of a “fight” really. It’s more cooperative since it’s just as much fun to be attacked as it is to splatter others. Part of the fun is surprising someone, sneaking up to them and planting a blob right on their back, shoulder or leg… as you race away grinning, and secretly hoping, but also looking out for, someone who will do the same to you. And it’s absolutely hilarious! Once the spraying begins, you can’t hear anything except shrieks of delight and laughter. We all (yes, counselors and directors too!) quickly begin to look pretty funny, our hair sticking up, with white beards and mustaches, if not completely foamy. 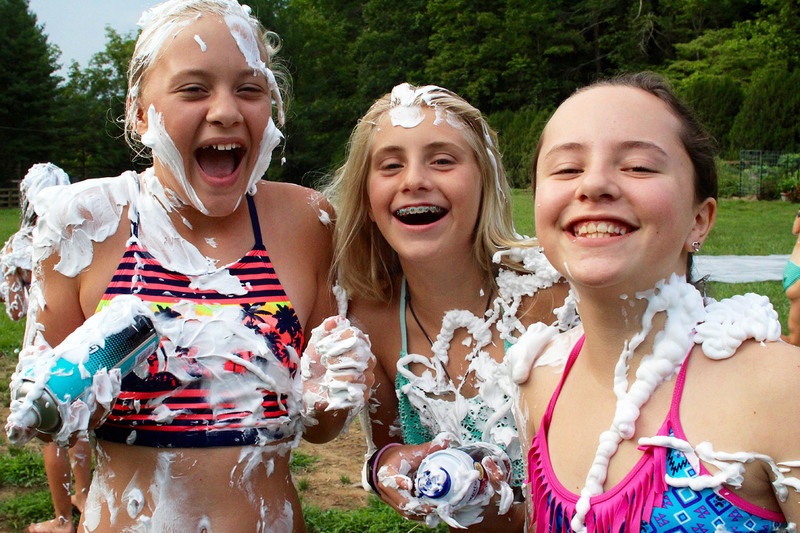 A shaving cream fight feels liberating too. 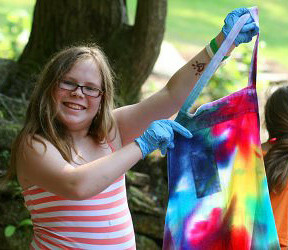 It’s a little mischievous and outrageous, but still sanctioned, even celebrated at camp. It’s a harmless way to go a little crazy, while at the same time laugh and play with your friends. What to learn from a shaving cream fight? I’m not sure, but I’d say it’s a wonderful way to experience uninhibited joy, a deep feeling that in our ordinary lives too often struggles to find expression. At camp though, it’s pretty easy; we find it everyday. One way we punctuate the week at Rockbrook is to change the pace on Sundays. 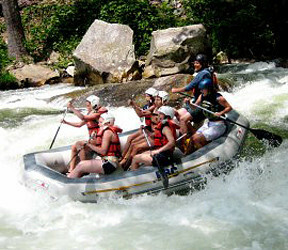 We follow a different schedule and plan special surprise events for the whole camp. It began today by sleeping in, which felt wonderful after the very full week we’ve been enjoying, but even better, the girls and their counselors came to breakfast in their pajamas and robes. Rick arrived much earlier in the kitchen and baked for us his yummy maple cinnamon coffee cake to complement the regular yogurt, cereal, and fresh fruit bars. After breakfast the girls returned to their cabins to clean and sort things, as today is also the day laundry goes out. You can imagine how that might take a while! 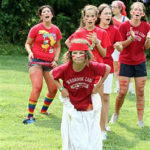 Around 10:30 the whole camp, dressed in their red and white uniforms, then assembled in cabin groups around the flagpole on the hill for a flag raising ceremony led by the Hi-Ups (10th graders). This included presenting the flag, reciting the Pledge of Allegiance, and singing “America the Beautiful.” As we stood in the bright morning sunshine, overlooking the Blue Ridge mountains in the distance, and flanked by the historic camp buildings, this was a very neat scene. 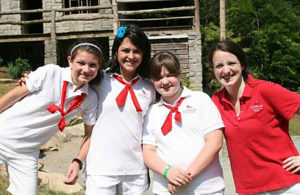 Next, the girls walked down the lower line to a special wooded area of camp for our chapel service. For years now Rockbrook has been explicitly non-denominational and ecumenical with no religious affiliation. It’s been a place where girls from all cultural and religious traditions (and non-religions!) can feel comfortable. Instead of specific religious texts or ideas, our chapel services are more thematic, focus on general human values (things like honesty, friendship and community), and are led by the girls themselves. For example, today the Middler line presented their chapel on “Simplicity” by leading several songs, reading a poem, and talking about what simplicity means to them. Sarah read (paraphrased actually) a short book to the girls called “Crispin: The Pig Who Had it All” by Ted Dewan. It’s about a spoiled pig who, instead of receiving the kind of big gifts he’s used to, gets an empty box from Santa. He naturally struggles with this at first, but in the end learns about imaginative play. 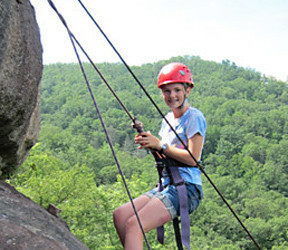 Sarah connected it with camp, of course, noting how being at Rockbrook also encourages us to simplify (no technology! ), yet equally inspires our imagination, sense of wonder and connections with others. 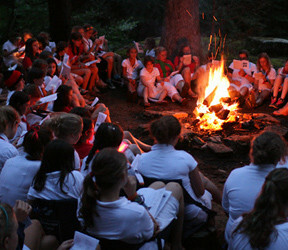 The chapel is intended to be a quiet time for reflection and an opportunity to gather together as a camp community. It’s a nice balance to the zany fun we enjoy the rest of the week. After lunch, which was a classic combination of baked ham (or tempeh), green beans and mashed potatoes, and after rest hour, which included a brief, welcome thundershower, the whole camp geared up for the Rockbrook Olympics. We divided into 3 teams, anticipating tomorrow’s holiday— red, white and blue —so that teams included girls from all three age groups. Each team, dressed and painted in their color, came up with a cheer and assigned participants for different relay events to be held down on the landsports field. We had a water balloon toss, a sack race, three-legged race, dizzy lizzy, spoon and egg carry, army crawl, sponge relay, frozen t-shirt thaw, a wheelbarrow race, and a huge, group hula hoop relay. The energy level was intense as everyone raced from one event to the next, stopping now and then for a drink or snack under the tents. For the final event, we all headed back up to the lake for a greased watermelon relay. Even more cheering! As is typical around here, we’re not really sure who “won” because we didn’t keep score. There’s just no need, and it’s really not that important, when you’re having this much fun playing and cheering everyone on. So much fun! 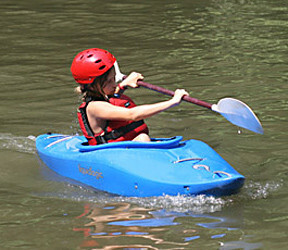 Going around camp today, visiting the different activity areas, you could tell that the girls have really settled in and begun to make camp “a place of their own.” That’s a phrase from the Rockbrook Camp mission statement. 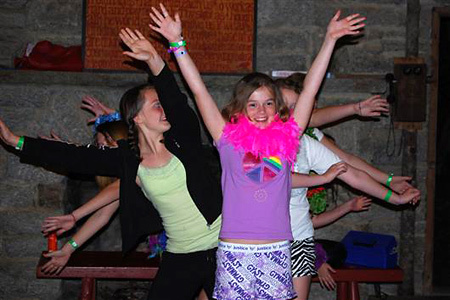 It’s an attempt to summarize one of the real values of a camp experience for young girls, and it’s part of the magic of why campers love their camp. The ingredients are simple: really good people who are eager to make friends, broad opportunities to be creative, sporty, and adventurous, and a caring environment where everyone can relax and be themselves. 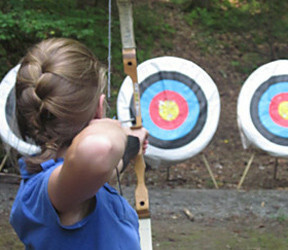 Combine these with the girls making their own activity selections, having plenty of free time to enjoy the wonderful natural beauty of Rockbrook, and simply enjoying time with their friends, and we have something special, something very different from home and school (where parents and teachers call most of the shots), and something truly their own. This is their camp and they love it. 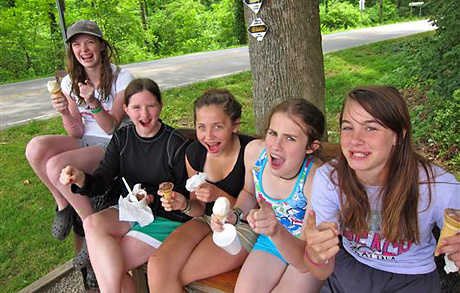 Of course, at camp a big group of girls can get pretty goofy and really let their silly side come out. Singing crazy songs outrageously loud in the dining hall, dressing up in a costumes for dinner, and making up skits with cabin mates are quite ordinarily part of the fun around here. 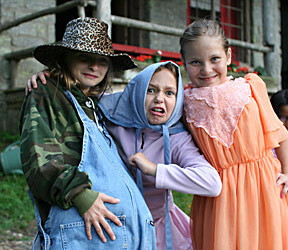 This photo of an evening program cabin skit shows a little of that. Each cabin group is given a topic and challenged to come up with a group skit that they’ll perform for the rest of the age group in their lodge. It can involve singing, dancing, acting and audience participation, but whatever it is, the funnier it is, the better. 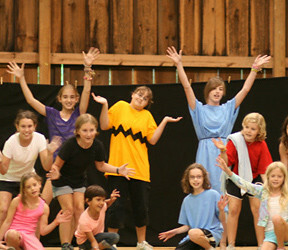 A lot of the fun is working together to create the skit, as well as performing it for your friends. This afternoon we had our Wednesday “Cabin Day.” This is a special day when after a morning of regular activity time (where the girls follow their individual activity selections), each cabin group sticks together for some special group event. Today, cabin groups were hiking to Rockbrook Falls and Castle Rock, building campfires to make S’mores, playing games in the gym and on the landsports field, cooling of by playing in the creek, and even making smoothies with the help of the kitchen. The mini session senior cabins took a trip to Sliding Rock, had a picnic and capped everything off with a stop at Dolly’s for a sweet treat. Dinner was some of Rick’s homemade fried chicken and warm yeast rolls. Good stuff. On cabin day, there’s always a lot going on! Oh! I forgot to mention the muffins today… White Chocolate Raspberry. They were awesome! Do you have this in common with Napoleon Dynamite— being a tetherball champ? 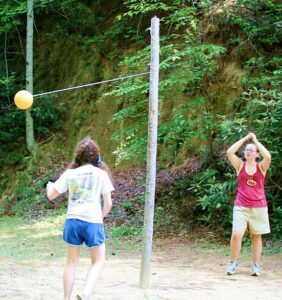 Sure you’ve played before at camp, and you know how to play tetherball, but maybe you need a few more strategies to really pump up your game. Here’s a couple of things to practice. The most important strategy is mastering an extreme angle when serving. By hitting the ball sharply down, it can swing high over your opponent’s head. This is always a good tactic. 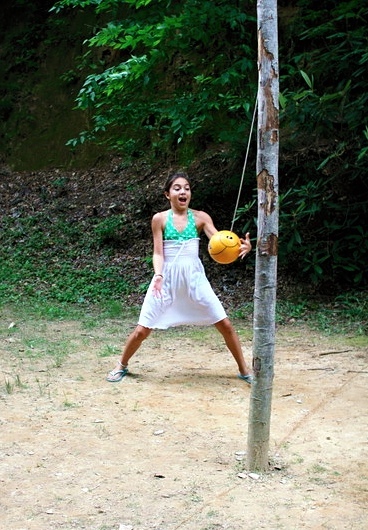 It’s also important to use both hands when playing tetherball. You can hit the ball more powerfully, but also add unexpected spins and hits by changing which hand hits the ball. You can surprise and confuse the other player with different fast/slow, open/closed, left/right hand maneuvers. Equally important to mastering tetherball is being quick on your feet. Moving forward and backward quickly, and knowing when to move sideways. This not only makes it difficult for the other player to decide how to serve or hit the ball, it gives you a better chance to make defensive hits. 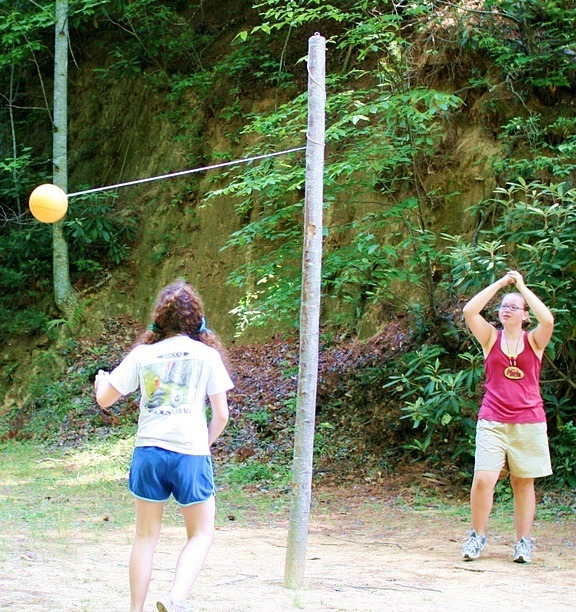 Of course, being a tetherball sports champ takes practice, but that’s what camp is for! OK, do you have any other tetherball tips, strategies or tactics? Whoa, what’s going on here!? Is it a craft project gone horribly wrong? The results of a crazy painting game? A strange spa treatment of some sort? A super intense outdoor food fight? Nope. It’s actually a glimpse into one of our all-camp afternoon games we played last summer. This one was a camp Olympics. 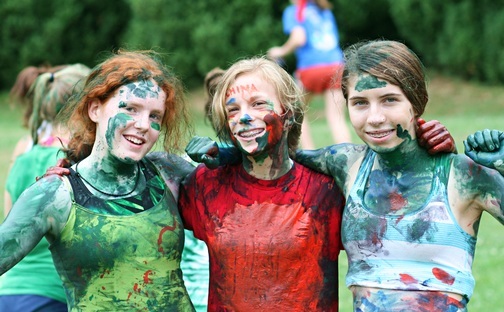 We divided all the girls into four countries (teams) and gave each a different color: red, green, glue and yellow. As you can see, red was China. All the teams then competed in all sorts of field games and races. We had the crab walk, an obstacle course, an egg toss, a 3-legged race, a hopping race, and so many more. Lots of running! Cheering! Excitement! Crazy Camp Fun! Lately we’ve been getting a few questions about how to play the game tetherball. The main goal is for each player (there are only two kids, one against the other) to hit the ball in a direction that will wrap the cord up around the center pole. Each opponent is hitting the ball in an opposite direction, so that’s the contest— you hit it one way and she hits it the other way. The trick is to hit the ball so that it’s hard for your opponent to reach the ball and hit it back. One strategy is to hit the ball downward so that it goes high (and hopefully out of reach) when it wraps around to your opponent’s side. You win when you wrap the cord completely around in your direction and the ball hits the pole. After you play a while kids can add rules that make the game more challenging and fun. Maybe you can allow only certain kinds of hits, or require that the ball wrap around high on the pole, or create funny penalties for “carrying” the ball or grabbing the string. Like all great games, there are loads of options! Tetherball is one of those amazing outdoor games kids love to play at camp. Got a free minute? Let’s play! P.S. Want to learn more about tetherball? Check out this article. It looks like a crazy, intense game of Dodge Ball! All the balls, the teams, the people zooming around grabbing, ducking, weaving, jumping and of course laughing the whole time. Games and other activities like this are always fun down at the gym, and with a little creativity, it’s easy to think up variations (like these). Got your arm warmed up and ready for a game? What Outdoor Game is the Most Fun? 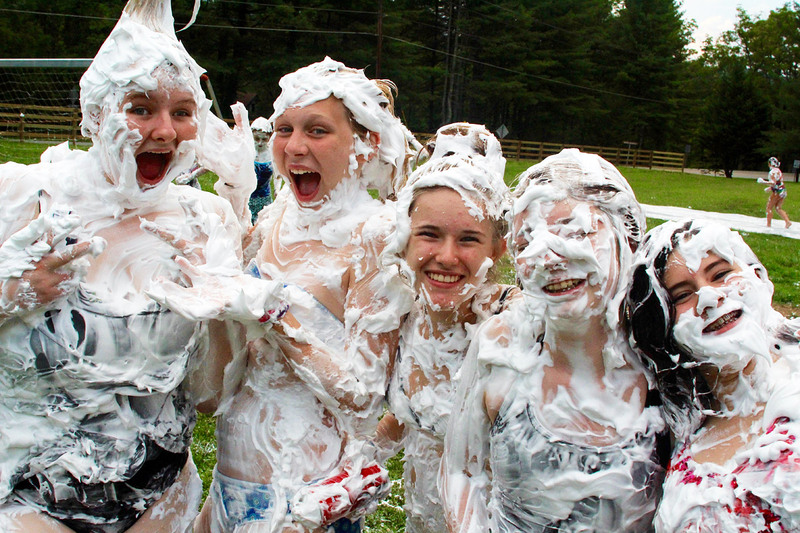 It’s true; there’s really nothing quite like a summer game of 50 kids and teens running around tryng the cover each other in shaving cream. Not really many rules to the game, but it won’t be long, and you’ll be laughing your head off. Spraying, sculpting, smearing— your hair will be a work of art. And it doesn’t matter how old you are. It’s an outdoor game for little kids, teens, and college-aged counselors alike. Everybody has just the best time. 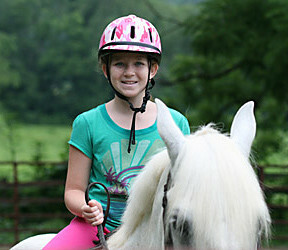 Rockbrook has its own “Girls on the Run” program in the summer. 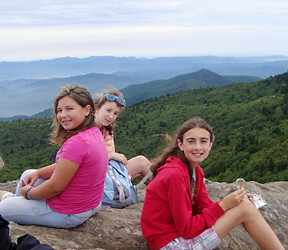 If you’re not familiar with it, Girls on the Run is a national program (with individual local chapters) that helps girls “develop self-respect and healthy lifestyles through running.” Did you know that Charlotte, one of Rockbrook’s former directors, is one of the coaches for the Brevard GOTR program? Here’s an article about it. 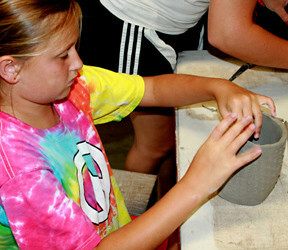 The article does an excellent job describing the program and the benefits it provides the girls who participate. You’ll see it’s a great thing to do!